Pollinators can provide a very real and tangible connection between natural habitats, and daily human life. This is especially relevant for rural subsistence farmers, but everyone who eats food on this planet is connected to a pollinator. We hope to use this site, Discover Pollinators, to inspire awareness about pollinators and sustainable human livelihoods. This site features the remarkable links between agriculture and wild pollinators and seeks to build a strong grassroots movement for the protection of habitats, better farming practices and restoration of pollination services where they have suffered. The interactions between flowers and their pollinators are also intricate and interesting in their own right. We hope to share this sense of wonder with future generations of conservationists through this site. The Insect Committee of Nature Kenya is currently Chaired by Dr. Dino J. Martins. Dr Martins is a naturalist, artist and writer with a broad interest in the science of entomology and the big-picture of biodiversity conservation. Dr. Martins, an entomologist and ecologist, is a postdoctoral fellow with the Stonybrook – Turkana Basin Institute and a Research Associate of the Museum of Comparative Zoology at Harvard and the Smithsonian Institution. He recently completed his PhD in Organismic and Evolutionary Biology at Harvard University. A prolific writer, he has published numerous articles in scientific, natural history, and environmental magazines. His current work in conservation is focused on the conservation of pollinators, which provide a link between natural areas and human livelihood. Dr. Martins’s current scientific research is on the interactions of insects and plants. He looks at what drives cooperation between insects and plants mainly between flowers and their pollinators as well as between ants and plants. 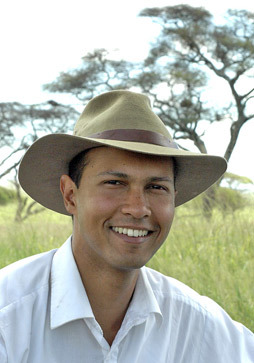 Dr. Martins’ current research includes work with farmers in relation to bees and pesticides and improving pollinator awareness and conservation, general studies of bee evolution and ecology in East Africa, hawkmoth and butterfly pollination, co-evolution and the links between biodiversity and landscape-level processes as well as the biology of vectors. Amongst his awards and fellowships are the Derek Bok Teaching Award and the Ashford Fellowship in the Natural Sciences from Harvard University, in 2004 the Smithsonian Institution Fellowship, and the 2002 & 2003 Peter Jenkins Award for Excellence in African Environmental Journalism. In 2009 he won the Whitley Award for Conservation and in 2011 was selected as one of National Geographic’s ‘Emerging Explorers’.